Hi All ........ Firstly a huge apology from me that this post didn't go up at midnight, especially to our lovely guest who has done a very special project for us. My brain is getting more and more like a sieve letting things slip through but I am here now with and our very special guest Creative Guide who is the amazing Tracy Scott. Those of you who know Tracy's work will have seen her wonderful art and images, so we will get straight into her post. 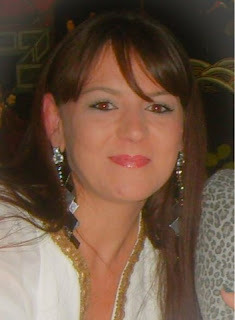 My name is Tracy Scott and I am a Mixed Media artist from East London. When I am not at the 'day job' as a Finance Officer' I love nothing better than to get inky and painty. A self confessed 'colourholic' you will always be guaranteed a little colour fix when I'm around !!! 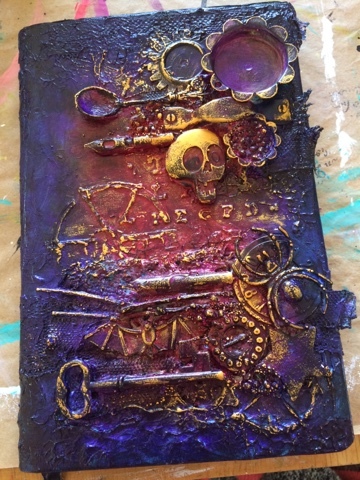 Step 1: I took an old diary that was just waiting to be altered and to start I used some modelling paste from DecoArt and various stencils and added some texture to my covers. 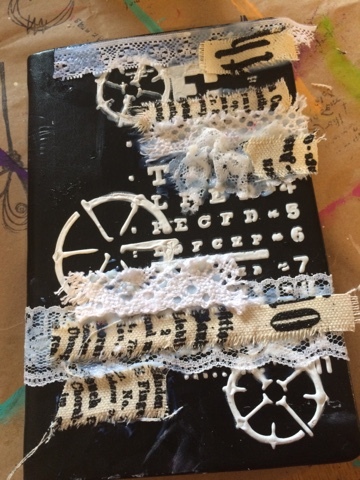 Step 2: I added some extra texture to my piece using some old pieces of lace and printed canvas. Tearing layering and gluing using the Prima Art Basics 3D matte medium. Step 3: using various metal, plastic and even some old twigs I glued these down to my cover to create even more 3D texture. 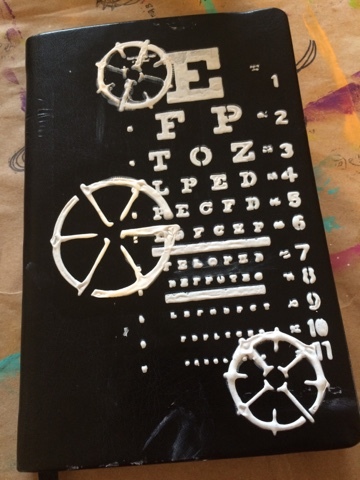 The Prima 3D matte medium ensures that the pieces are not going anywhere once they are dry !! 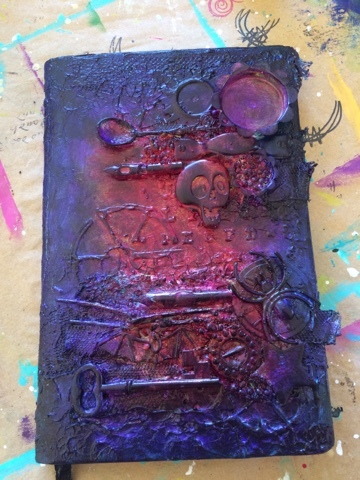 Step 4: I decided that I needed even more texture so decided to add some crackle paste randomly over my cover with a pallet knife. Step 5: ok so once everything was completely dry I added a coat of white gesso all over the covers, front and back to create a good base for some paint colours. Step 6: for my covers I painted the middle first with DecoArt green gold and the outside with phalo blue. Then went over the centre with quinacradone magenta and the outside with dioxizine purple. Step 7: I love the metallic lustres and Orange flicker is definately one of my favourites so of course I had to grab for it !!! Step 8: with a small amount of the orange flicker at a time I rubbed it over the top with my finger on the textured areas so that it caught the raised areas. 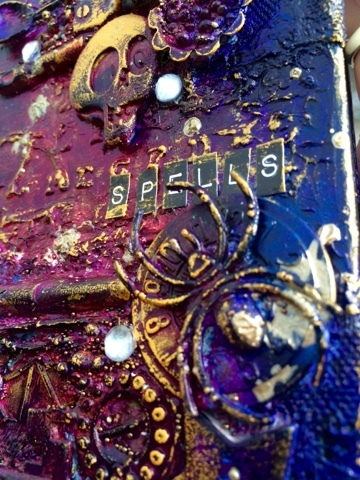 Step 9: last but not least I added some of the Tim Holtz letter stickers to read the word 'spells' to the from of my book. I glued these down with gel medium to make them more secure. 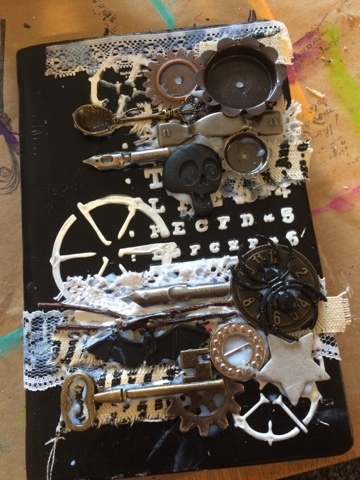 I had an absolute blast creating this cover and can't wait to start recycling the inside pages into a fabulously spooky art journal !! 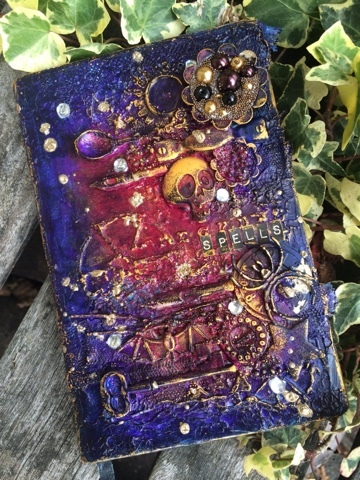 Wow thanks so much Tracy this is fabulous and such a wonderful cover, I know if it were mine I would be wanting to use the book often to get the pages filled with wonderful painty works of art. We really appreciate you joining us here at A Vintage Journey. Now did you know Tracy has also launched her own range of stamps? 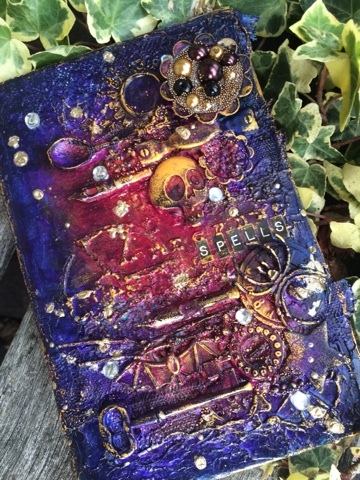 They are gorgeous so if you click HERE you will see them for sale at Country View Crafts who is one of our regular sponsors and HERE when they were launched by Tracy on the PaperArtsy blog. Thanks for sharing Tracy's part of our Vintage Journey and we look forward to seeing you all here again on Monday. 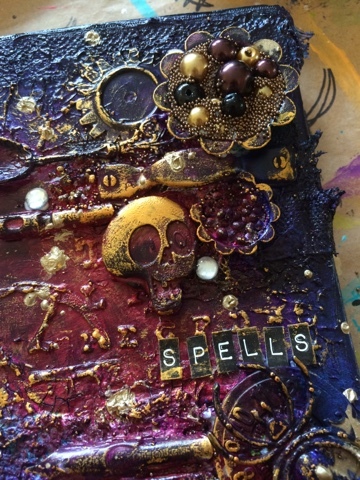 This is a fabulous project, love the rich colours. What an amazing transformation!!! 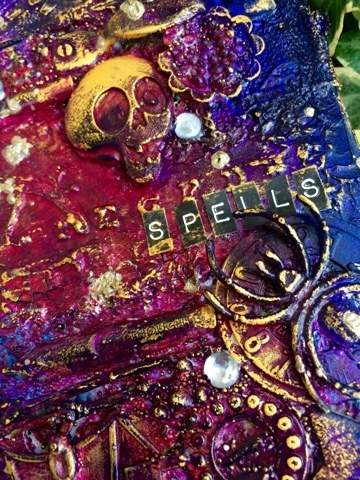 Absolutely gorgeous journal cover with those wonderful deep and saturated colours. 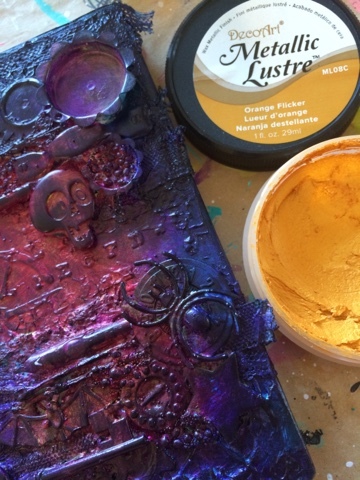 The lustre brings out the textures to amazing effect! 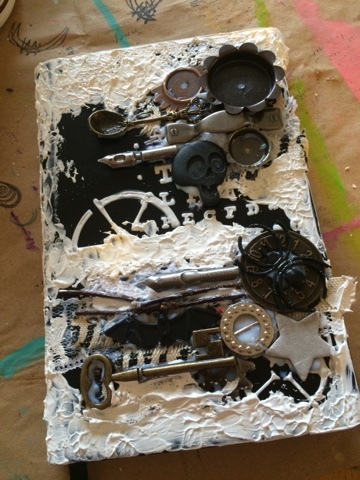 Thanks for sharing your beautiful work with us here at AVJ! Such a beautifully textured journal cover..makes you just want to reach out and touch it. What an amazing book, Tracy! Love those colours, and as for the texture....!! 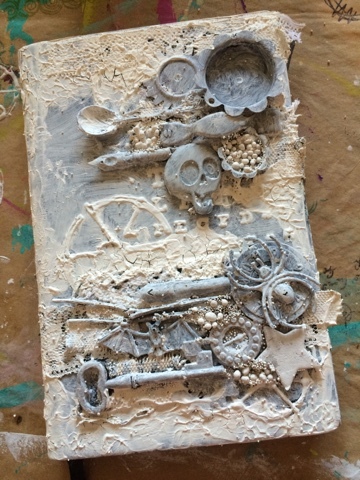 Well... let's just get down to the nuts and bolts of the situation.....ABSOLUTELY ABSTRACTLY AMAZING ANATOMY of a journal cover Tracy. So RICH and YUMMY in COLOR and TEXTURE... luring us into the depths by it's SPELL OF SPLENDID SPOOFS. Who would ever guess that beneath the layers of GLITZ and GLAM were hiding commonality like metals, twigs and perhaps even some eye of newt or toe of frog???? ENCHANTING! Xj. Outstanding Tracy!!! Love love love those colors!